Is Constellation Brands Now a Marijuana Stock? The beer, wine, and spirits company is doubling down on the biggest name in marijuana. The U.S. beer industry has seen better days. Millennials, now the largest generational cohort, don't share their parents' affection for beer, and instead prefer hard spirits or wine. And Big Beer has fared worse than the overall industry, as drinkers are increasingly eschewing mass-market labels like Budweiser, Coors Light, and Bud Light in favor of craft brews. 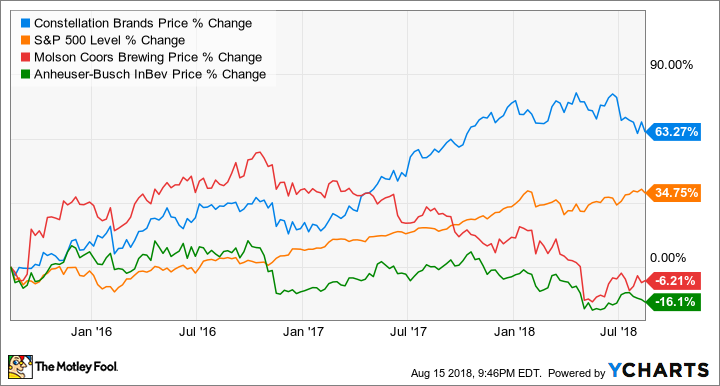 The shift has weighed on the stocks of major brewers Anheuser Busch InBev and Molson Coors Brewing: Both companies have underperformed the market. Constellation Brands (NYSE:STZ) has taken a different approach. Last year, the company surprised investors by taking a stake in marijuana company Canopy Growth (NYSE:CGC), and recently doubled down on this investment. Are these the early signs of a major change in direction for the company? In October, Constellation Brands took a near-10% position in Canopy Growth, paying $191 million for its stake, which valued the company at nearly $2 billion. It was a controversial move, but CEO Rob Sands justified the investment by explaining that the company eventually expected nationwide marijuana legalization. This month, Sands doubled down on the initial investment, paying $3.88 billion to raise its total stake to 38% -- a premium of over 50% to the prior-day's close on the Toronto Stock Exchange. Constellation receives other benefits from this deal, namely warrants that could increase its ownership stake to 50% and control of the board with four of seven seats. While this stake will allow Constellation Brands to better enter a potential growth area, it's not quite a marijuana stock. Investors should understand that this purchase won't have an immediate effect on the broader business. Last quarter, Canopy Growth reported C$25 million ($19 million) in revenue, versus $2 billion for Constellation Brands. Revenue attributable to Constellation Brands' smallest segment, spirits, was $80 million in the quarter. However, marijuana has the potential to become a major gateway to future returns: Canopy Growth grew revenue 63% year over year, and industry analysts expect the legal marijuana business to grow to $31 billion by 2020. The next tailwind will come from Canopy Growth's home market of Canada, as the country's recently enacted marijuana legalization will take effect in October. Although investors were lukewarm on the announcement, particularly when Constellation noted that the acquisition would halt any stock buybacks for the next 18 months, long-term investors should be encouraged by the announcement. In an interview with CNBC, Sands mentioned it was his goal to make marijuana a "fourth leg of the business" behind beer, wine, and spirits -- this could be a better approach than the plans of other mega brewers to buy up craft brewers, especially now that craft sales are beginning to slow. Constellation Brands has the assets and logistical wherewithal to immediately become the biggest name in the marijuana market, one that will continue to grow at high rates going forward regardless of whether or not the U.S. legalizes the product.